Brewers pitcher Francisco Rodriguez celebrates with catcher Jonathan Lucroy after closing out the victory against the Phillies on Thursday night. Everything is clicking for the Milwaukee Brewers. 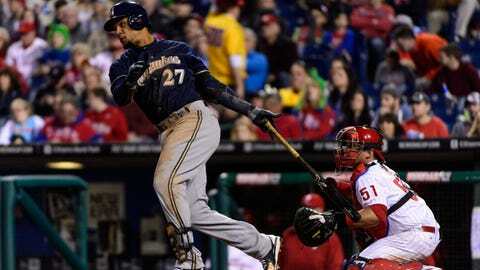 Dominant in every aspect of the game over the last six contests, the Brewers completed a perfect, six-game road trip by sweeping Philadelphia with a 6-2 victory Thursday at Citizens Bank Park. At 7-2, Milwaukee is off to its best start to a season since 1998 and swept a road trip of six or more games for the first time since 1998. Thursday’s win followed a similar blueprint as the trip’s previous five — clutch hitting mixed with good starting pitching and lights-out work from the bullpen. "There are a lot of good things happening right now," Brewers centerfielder Carlos Gomez said. "It’s about keeping the good feeling around here and continuing to play good ball." Over the six games in Boston and Philadelphia, the Brewers hit .320 with 33 extra-base hits and averaged seven runs per game. Combine a dominant offense with a 1.93 team ERA and it’s a recipe for success. Milwaukee had at least nine hits in all six games, trailing after just four innings. To put just how impressive this road trip was in perspective, the Brewers didn’t win their sixth road game of 2013 until May 13. "I know pitchers don’t really want to face us right now," Brewers left fielder Khris Davis said. The Brewers fell behind 1-0 on Thursday on a Marlon Byrd home run in the second inning, but an RBI double from Aramis Ramirez and an RBI single from Davis gave them the lead for good in the fourth. Back-to-back doubles by Jonathan Lucroy and Davis against Phillies starter Cliff Lee gave the Brewers a big insurance run in the sixth inning before they broke it open with three runs in the seventh. "I heard he was a strike thrower, so the plan was to be aggressive on him and not fall behind because that changeup is dirty," Davis said of Lee. "It was just about being aggressive on him and we strung him along." After allowing the early home run to Byrd, Marco Estrada cruised into the sixth inning before running into a bit of trouble. Estrada issued a two-out walk to Jimmy Rollins before Chase Utley singled and Ryan Howard walked to load the bases. Byrd hit a slow chopper to Ramirez at third and beat the throw across the diamond to score Rollins and cut the Brewers’ lead to 3-2. Estrada was able to work out of the jam with the lead intact by getting Domonic Brown to fly out to center. Estrada started the road trip with a win in Boston and finished it with a quality start against the Phillies. The right-hander allowed two runs on five hits with six strikeouts over six innings Thursday. 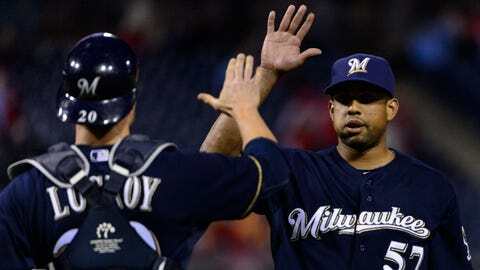 "Marco was really throwing the ball great," Brewers manager Ron Roenicke said. "With his pitch count, he was going to go out for another inning but he was second up the next inning." Milwaukee’s bullpen took it from there, as Tyler Thornburg, Will Smith and Francisco Rodriguez worked three scoreless frames. The relief corps has allowed just one earned run in 21 2/3 innings. Five regulars in the lineup are hitting over .300, while Ryan Braun came to Philadelphia hitting .150 with no runs driven in and left with a .281 average and 10 RBI. On the trip, Davis hit .429, Ramirez had a .400 batting average, Jean Segura hit .391 and Lucroy was .360. "When everybody puts a little bit into something, it makes it tough," Gomez said. "We had a great road trip. It tells everybody that the Brewers swing the bat, run the bases (aggressively). They are aggressive on the bases, aggressive at the plate and they also have good starting pitching and relievers." The Brewers now return home to face the Pirates and Cardinals before heading to Pittsburgh for a three-game series. Milwaukee will enter a big nine-game stretch against two teams that finished at the top of the National League Central last year playing great baseball. "Just keep it up," Roenicke said. "Great pitching again, big hits. The bullpen is coming in and doing a great job. Everything is working."